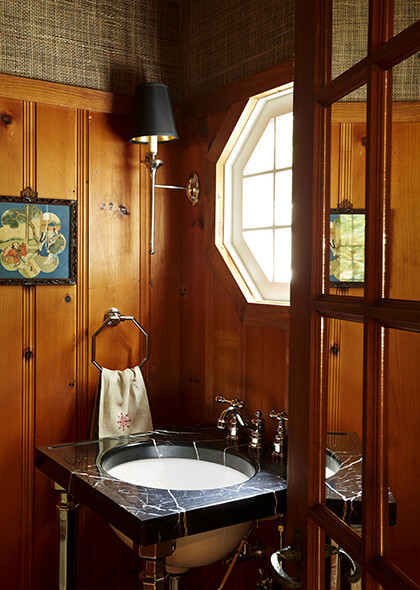 With a stunning lake view and an interior to match, this deluxe Door County cottage was redecorated to create an even more comfortable and captivating environment. A transformative teal on the main level illuminates patterns, printed fabric and new accessories while also drawing a beautiful contrast to the all-wood parlor room nearby. Antiques and collectibles cap off a home designed for memorable experiences. This project was featured in Architectural Digest‘s home tour “A Traditional 100-Year-Old Lake House Reborn” in July 2016. Redesigned for the clients’ adult children, each bedroom was made to be casual and comfortable, with light, natural linens and details reminiscent of coastal New England. The clients also requested their interiors had personality and appeared lived in. So we made several antique excursions all along the peninsula to find the final details to bring each space together.